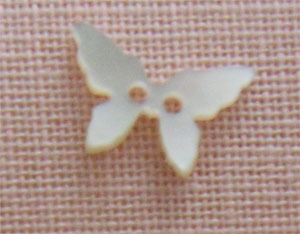 Genuine mother-of-pearl buttons in the exceptional shape of a butterfly. These buttons show the natural colour of white mother-of-pearl: a kind of creamy white. As mother-of-pearl is a natural material, the colour shades can vary, especially with the light. That is why our presentation picture can't show you the exact colour of the button. Both sides are identical: unlike the other mother-of-pearl buttons, the back of the butterfly button is as perfect as the front side. These genuine mother-of-pearl buttons come from a French company settled in Méru since 1937. This small town, located 50 kms from Paris, used to be one of the most important French mother-of-pearl centres with many people involved in making items of (or inlaid with) mother-of-pearl. The French mother-of-pearl museum ('Musée de la Nacre et de la Tabletterie') can still be visited at Méru. Nowdays, the buttons are produced in Madagascar as the European labor costs wouldn't allow such low prices. The making process is under strict control regarding environmental conservation. You just have to pick the size of your choice in the choice box below and then to adjust the quantity to your need. If you want several sizes, choose one first, then add it to your cart, click on the "continue shopping" button and repeat the operation with the other one. Mother-of-pearl buttons. Price: £3,00 each whatever the size.